Pre-payment is required for all lodging check-ins. Check-in is available any time during our normal business hours. Standard checkout is at 11 AM. Half the daily rate will be charged for late checkouts. 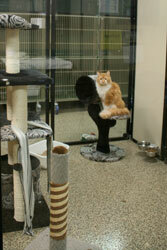 The Lion's Den is a peaceful haven for our feline friends and is away from all dogs. Choose between Condo Suites or luxurious Penthouse Suites. The cats have a separate ventilation system from the rest of Stone Mountain Pet Lodge, so not only do they never see a dog, they can never smell a dog! In addition to that, every cat has his or her own bathroom exhaust fan to remove any odors. A pheromone diffuser in the cattery helps keep our feline guests calm and happy. We feed Felidae Pure Sea as an in-house food, but we always suggest bringing in your cat’s usual food, as they can be pretty finicky! We feed the cats twice daily (or your custom schedule), and fresh water is available at all times. If your cat has special needs such as a special diet or medication to be administered, one of our qualified Pet Care Technicians will make sure those needs are met. Just choose a suite for your cat and we'll take care of the rest! All prices are per cat. Prices subject to change without notice. *Medications and injections are charged per administration.